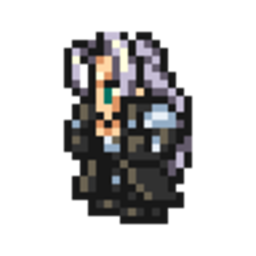 Once a member of SOLDIER and well-respected hero of Shinra, Sephiroth changed when he learned he was himself an experimental construct. He plots to destroy the planet out of his deep hatred for humanity. Wields katanas and daggers. Can use rare samurai abilities, countering enemy attacks or afflicting them with punishing debuffs. Oblivion (VII)(Sephiroth) Deliver a lightning-quick sword slash. Deal two physical attacks to one target, ignoring its Defense. Deal four physical fire and non-elemental attacks to one target. Deal three to five physical dark and non-elemental attacks to one target. The number of attacks dealt depends on the user's Attack. Deal two physical dark and non-elemental attacks to all targets, temporarily lower the user's Defense a moderate amount, and raise the user's Attack a moderate amount. Grant unlimited use of darkness abilities, grant up to a moderate Darkness Ability Boost, and causes the user's darkness abilities to trigger twice. Gain a moderate amount of Attack and Defense for each KO'd ally or empty party slot. Deal significantly more physical damage when a katana is equipped. Deal much more physical damage when a katana is equipped. Deal slightly more physical damage when a katana is equipped. When low on HP, restore HP to the user, temporarily lower their Defense a large amount, temporarily raise their Attack a large amount, and reduce delay of their actions. Can only trigger once per battle. Begin battle temporarily infused with the power of the dark. Small chance for darkness abilities to trigger twice. Samurai Sphere S. Lv.1 +3 ATK Complete the Warrior Sphere. Dark Knight Sphere S. Lv.1 +2 ATK Complete the Warrior Sphere. Warmage Sphere S. Lv.1 +3 ATK Complete the Knight Sphere. Complete the Red Mage Sphere. Demonsblood Sphere S. Lv.1 Use 6★ Samurai Abilities Use 5★ Samurai Mote x1. Sephiroth Legend Sphere S. Lv.1 +10 DEF Complete the Samurai Sphere. Complete the Dark Knight Sphere.